Finding Your Bliss-- ArtBliss, that is! As summer approaches-- and yes, we actually do have what passes for summer in Vermont although it's been raining and in the 40s for a week now-- many of us are thinking about vacation. Since we have animals-- like a pony and chickens-- it's not so easy to get away. We have to find someone to feed them who is willing to come over in early evening and wait for the “girls”-- our layers-- to sashay their feathery butts up into their roost so they can be locked safely away from the numerous and hungry predators that prowl our backyard. Everything, it seems, loves chicken! So we mainly take day trips around our own state and neighboring New Hampshire or short weekend jaunts to 18th c. re-enacting events. I'm one of those “active vacation” people-- the idea of swinging in a hammock while sipping an umbrella-topped drink and gazing out at the ocean seems boring beyond words. With a more interesting goal in mind, in September my husband and I are trekking down to Washington, DC so I can participate as an instructor in the second year of classes at ArtBliss, an art retreat founded by my friends Cindy Wimmer and Jeanette Blix. I am really excited to be teaching again and so honored to be invited to participate with such esteemed artists as Deryn Mentock, Kerry Bogert, Richard Salley, Diane Cook, Jane Salley and Robert Dancik. Wow, what a lineup! 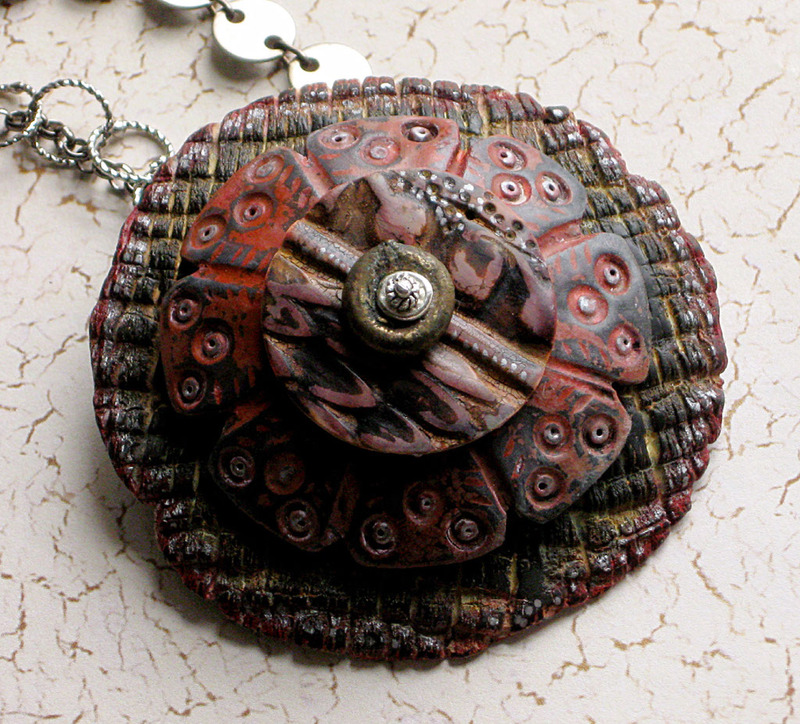 The class is called “Whimsical Blooms” and will teach my technique of making pendants by layering polymer clay shapes that have been textured and antiqued with various tools, paints, inks and patinas. The resulting element can be used for jewelry-making, scrapbooking or journals or even for home decoration. The possibilities are endless! We will play and create and generally have a blast while repeating my favorite art mantra: “There are no mistakes”. 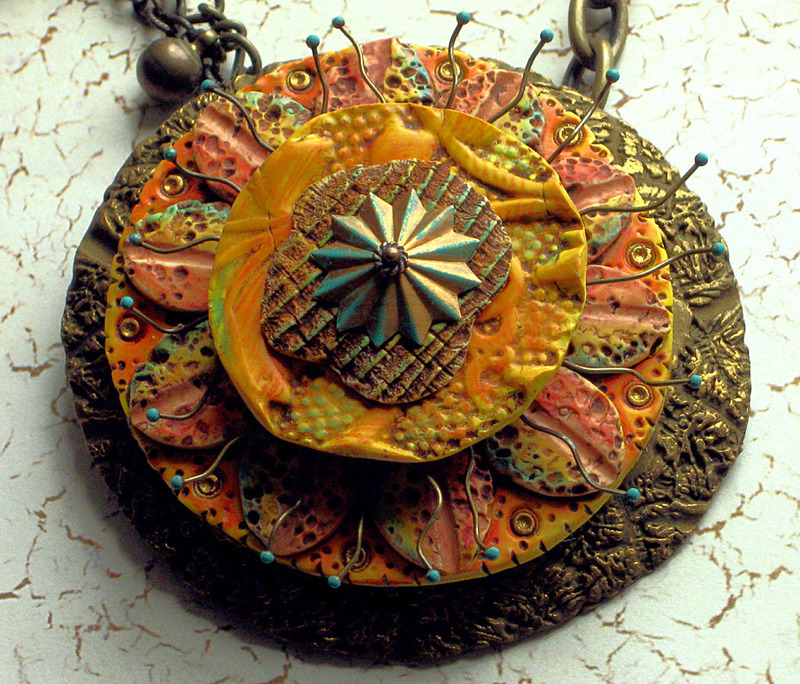 Any and all found objects are fodder for mold-making and texturing the clay or as pieces of the pendants themselves. Frequent readers of this blog have seen this series unfold over the past few months and as I was mulling over topics I might teach, this one just seemed perfect for students of differing levels and abilities. I know personally that I get the most out of a class when interacting with students from diverse artistic backgrounds and interests. This class will have structure and will teach technique but will leave plenty of room for creativity and experimentation and wild flights of imagination. Well, let's hope at least a few flights! My class is offered on Sunday, September 25 from 9 am to 4 pm but check out the other class descriptions and instructor bios here at www.artbliss.com. Registration has been open about a week so far but I'm guessing that with this group of instructors the classes will fill quickly. I'm encouraging my husband to take Richard Salley's class called “Lasting Impressions Earrings and Pendants”, stamping silver-bearing solder to make jewelry elements. I love Richard's work and I think he and Douglas would get along very well. Dougie is a blacksmith and does repousse work too so the metalwork focus of the class is appropriate to his interests. The festivities begin on Friday, September 23 with day classes taught by Deryn Mentock and Robert Dancik, followed by the evening Meet and Greet Reception and continuing on to Sunday night, September 25. The venue is the snazzy Embassy Suites Dulles-North Loudon with special room pricing for attendees. I read glowing reviews of last year's event and this one promises to be even more fun, instructive and filled with creative activity and inspiring instructors. I would love to meet you all there!